AMD® 2nd Generation Ryzen™ Threadripper™ Processor based on the newest and most revolutionary 14nm SOI technology with up to 32 cores provide an astonishing 64 threads of simultaneous multi-processing power, while up to 80MB of combined cache multi-way associative L1+L2+L3 Cache, X399 AMD® Chipset Motherboars are expandable to 64GB of DDR4 Quad Channel memory, the Xi® MTower™ 64 Workstation offers the highest level of computing power available today in a standard workstation and 64Bit Windows®/Linux® compatible processors. On-Board SATA6Gb/s w/RAID 0/1/5/10 capable, Gigabit Ethernet LAN, USB 2.0/3.0 & 3.1 ports, Dual M.2 up to 32Gbps, complete the options of the available motherboards. A wide choice of powerful video graphics cards like the NVIDIA® Quadro® and GeForce® video cards, make this unit the ideal choice for the most demanding CAD, CAE, CAM, GIS, Video Editing and engineering computational tasks. 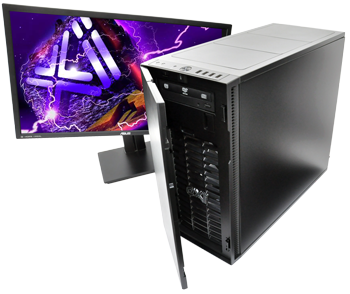 The Xi® MTower™ 64 Workstation will assure a growing longevity path to new technology application software, for years to come. Fully compatible with Microsoft® Windows® 10 and also supporting the most popular Linux® Operating Systems. A custom on-line quotation, using our highly customizable on line builder can be produced here. One of our experienced application consultants will be following up with the best recommendations in accordance with the client's computational requirements and applications. One of our experienced application consultants will be following up with the best recommendations in accordance with the client's computational requirements and applications. Featuring the new Intel® X399 Express Chipset and the AMD® Ryzen™ Threadripper Processors series!